In what once seemed to be an extremely promising season, men’s basketball’s hopes for a repeat NESCAC championship were dashed this weekend with a first-round loss to Middlebury. 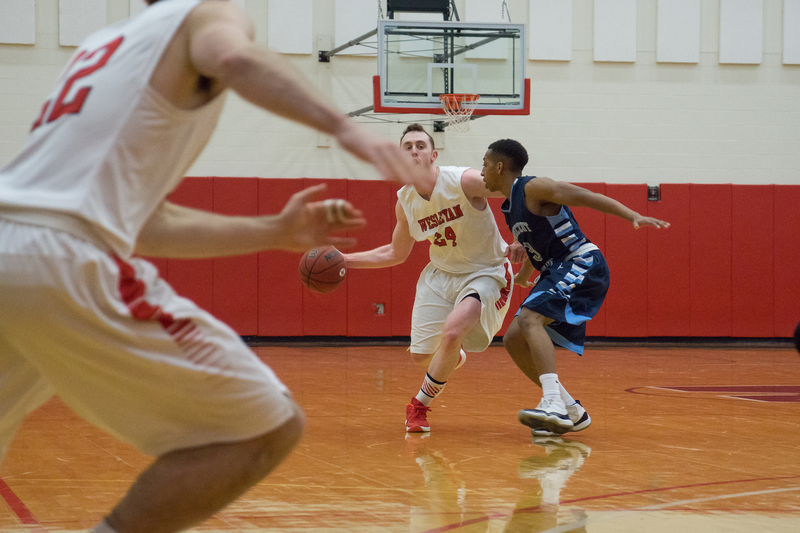 Following a pair of losses to close out the regular season, Wesleyan dropped to the fifth seed for the tournament. This seeding change forced them to leave the familiar confines of Silloway Gymnasium for a hostile territory, where they were unable to come away with a win. The Panthers controlled the contest from the get-go, led by standout guard Matt St. Amour. The Vermont native scored 11 of Middlebury’s first 19, including a trio of three-pointers, to propel his side to a 19-8 advantage. After entering the game about eight minutes in, Harry Rafferty ’17 quickly started closing this gap. Rafferty scored nine straight points in a span of under two minutes to narrow the deficit to 27-20, but was taken out of the game shortly thereafter. With the guard on the bench, Wesleyan’s shooters went cold and the offense committed multiple sloppy turnovers. Coming out of the break with a 13-point deficit, Wesleyan seemed unable to create any meaningful momentum as the second half began. Kevin O’Brien ’19 auspicated the action with an offensive board and putback, but his efforts were quickly nullified by a St. Amour layup. This sequence was an apt microcosm of the flow of play for most of the half, as Middlebury’s lead never grew over 15 or below 10 until Rafferty hit a three with eight minutes remaining to make the score 65-58. With St. Amour in a funk, Wesleyan jumped on its opportunity to equalize the contest. Nathan Krill ’18 got a transition layup to go with 5:47 remaining to make the score 68-63, Middlebury’s smallest lead since the game’s fourth minute. Just when it seemed that Wesleyan had found its way back into the game, though, its momentum was halted. Adisa Majors, a first-year reserve, single-handedly kept the Panthers’ offense flowing in St. Amour’s absence. Meanwhile, the Cardinals failed to convert on three consecutive possessions, allowing Middlebury to extend its lead to nine with a minute and a half to play. The Red and Black weren’t quite ready to roll over, though, and got hot from beyond the arc. Star guard BJ Davis ’16, who had been quiet for most of the contest, connected twice from deep in three possessions, accompanied by a three from Captain Jack Mackey ’16. Unfortunately, the team still struggled to contain Majors on the other end of the floor. The Cardinal defense was unable to prevent Middlebury from converting, and late-game free throws brought the final score to 86-74. St. Amour led the contest in scoring at 23, followed by Rafferty’s 19 and Majors’ 18. Majors also collected eight boards and had a pair of key blocks in the game’s waning moments, an outstanding effort from a player with extremely limited collegiate experience. Davis, Joseph Kuo ’17, and Mackey, Wesleyan’s most prolific offensive players, combined for just 25 points while shooting 9 of 30 from the field and 5 of 15 from the line, both poor figures. There were bright spots in the contest, though. Rafferty, the apparent heir to the starting spots which Davis and Mackey will vacate upon their impending graduation, proved his mettle in a key game. Krill, another contender for a starting spot next season, performed well with 12 points of efficient scoring. Jordan Sears ’18 also impressed in limited minutes, leading the game in both free throws made and attempted. With Davis, Mackey, Rashid Epps ’16, and Joe Edmonds ’16 leaving the program, the Cardinals will have to fill important roles but will not be decimated in terms of sheer quantity. O’Brien and Kuo should return as starters, and with Rafferty likely joining them, the program already has three strong pieces to build around in the starting lineup. As a former transfer, Edmonds also has another year of eligibility and could conceivably play another season, a scenario in which he would likely also occupy a spot in the lineup. While the future looks bright for Wesleyan’s returning players, the seniors will move on from the program with a combination of gratitude, nostalgia, regret, and a variety of other feelings. Mackey spoke to these mixed emotions, and what he will take away from his time with the program. Davis took a moment to talk about what has allowed Wesleyan basketball to blossom in recent years, both on and off the court.